Recently we had the opportunity to visit three of our school garden grant recipients and discovered they all had one thing in common: they sell the produce they grow to the community as a means of economic sustainability. 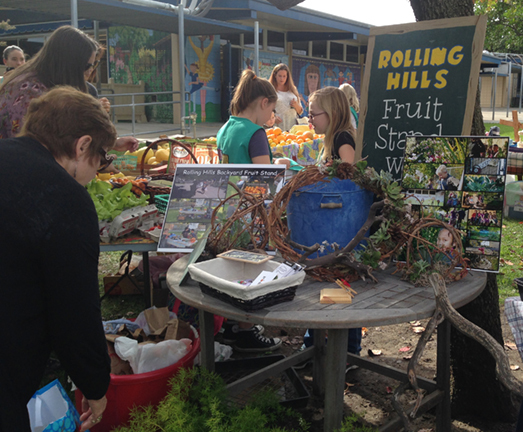 Our first stop was at Rolling Hills Elementary School in Fullerton, Calif., where we met up with Marilou Hertzberg who has big plans to expand the school-wide garden. Rolling Hills is unique in that it has several gardens throughout the campus that are designated to specific classrooms and teachers. However, Marilou wants to unify the school with one large garden area open to all students. The school-wide garden currently includes a human sundial, a labyrinth and pathways. But the plan is to add a vegetable garden, herbs to the labyrinth, a lazy river and a shaded area surrounded by fruit trees where students can do homework or read. Rolling Hills hopes to make those plans a reality with the help of a $1,500 grant from the Western Growers Foundation and the income from their monthly fruit and garden stand. Each month a different group of students is responsible for managing the mini farmers market on campus. They sell fruits and vegetables grown in the gardens, in addition to those donated by parents and community members, with all of the proceeds going back into school gardens. 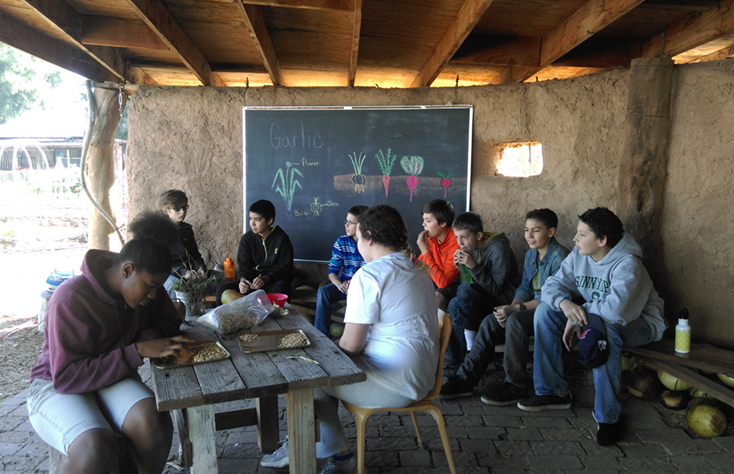 Another one of our grant schools, Desert Marigold School in Phoenix, is definitely intertwined with nature. Development director Amy Bird and garden coordinator Bobi Harshfield showed us around their 11,000 square foot garden comprised of vegetable and herb beds, fruit trees and a large plot for composting. Amy explained that all subjects are taught in the garden with each class spending at least an hour per week outdoors. 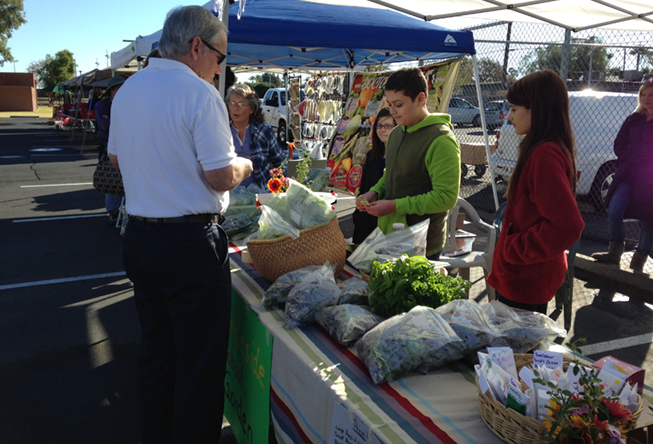 Students learn where their food comes from, in addition to business practices at their weekly farmers market. Students gain experience dealing with customers, managing money and practicing advertising skills by selling their produce after school. Like Rolling Hills, their profits go back into the garden fund to help buy supplies. Last, but certainly not least, we stopped by Ingleside Middle School in Phoenix. Ingleside’s school garden is maintained by Barbara Halden, whose green thumb has touched a number of schools in the area. Barbara works with the help of Susan Leonard, who is a physical education teacher, to make the most of their school campus garden. Unlike Desert Marigold’s acreage, Ingleside is limited to three planters and a small gated garden area, but the configuration is proof that size doesn’t matter. Despite their smaller operation, their garden is flourishing with a variety of herbs, lettuce, Swiss chard, blue cabbage, snap peas and purple cauliflower. The discovery of new foods was something that came up a lot in our talks about Ingleside’s garden program. Similar to the other schools, they sell the products of their garden to teachers and parents to help supplement the costs of maintenance. Barbara will often offer recipes to help their customers make the most of their healthy purchases. Western Growers Foundation would like to thank Rolling Hills Elementary, Desert Marigold School and Ingleside Middle School for welcoming us onto their campuses. We wish them much success in their business ventures and hope that other schools can follow their lead and increase their sustainability through commerce.